Hawkman thinks about his past lives in a scene from Hawkman #1. The character nicknamed the Winged Wonder sits in a weird place in the DC Comics pantheon. Hawkman’s made the big-deal jump from comics to cartoons (not to mention live-action) and has an instantly recognizable look. But all that look tells you is that he can fly and bust heads. Hawkman’s always been more than that. The character’s appearances on the Superfriends and Justice League cartoons have usually presented audiences with a streamlined version of a very complicated history. His roots go all the way back to the World War II era, the Golden Age of superhero comics. The first iteration of the character was Carter Hall, an American archaeologist who was the reincarnation of an ancient Egyptian prince. He discovered that a special element called “ninth metal” boosted his strength and let him defy gravity, using it to make wings and a belt for his superhero costume. After the superhero craze of the 1940s cooled, the character’s name and look were resurrected in the early 1960s, with a science fiction twist. The Silver Age Hawkman was a man named Katar Hol from the planet Thanagar and, was, essentially a space policeman. He came to Earth to chase a crook and stayed here to study our history. Variations on those two iterations came and went over the decades, including a series where writer Geoff Johns established that Hawkman was reincarnated throughout millennia as a conceit to weave his disparate history into one thread. The cover from Hawkman #1. You don’t need to know any of that to enjoy the new Hawkman #1, though. Written by Robert Venditti, with art by Bryan Hitch, Andrew Currie, Alex Sinclair, and Richard Starkings, the first issue homes in on the best aspects of the character. This Hawkman is Carter Hall, an archeologist who knows of his heroic past lives. But he’s driven by a need to know even more and Hawkman #1 sees him hunting down a mystical artifact that holds the power to unlock true knowledge of self. Don’t worry, he fights a giant talking ape, too. This take focuses on aspects of the character that I’ve always loved. He’s a superhero who goes to times and places even other superheroes don’t—so Hawkman stories should revel in exotic vistas, shifting vantage points, and undiscovered secrets. This one does exactly that and also does a nice job of blending tonalities from past eras of adventure storytelling. Pulp adventuring, Silver Age science fiction, and even some new-age spiritualism are part of the mix here, buttressing the premise that Carter Hall is someone who can exist heroically in different temporalities. Venditti finds a strong voicing for Carter, too: someone who’s down to earth when talking to friends, but ruminates in a lofty first-person narrative tinged with antiquarian cadences. Bryan Hitch makes Hawkman’s mix of conceptual ingredients sing here, drawing the crumbling remains of old-world ruins, sleek scifi hallucinations, and rumpled everyday interactions with equal aplomb. Sinclair’s work on colors makes sequences glow with a mythological energy that makes the whole book captivating. 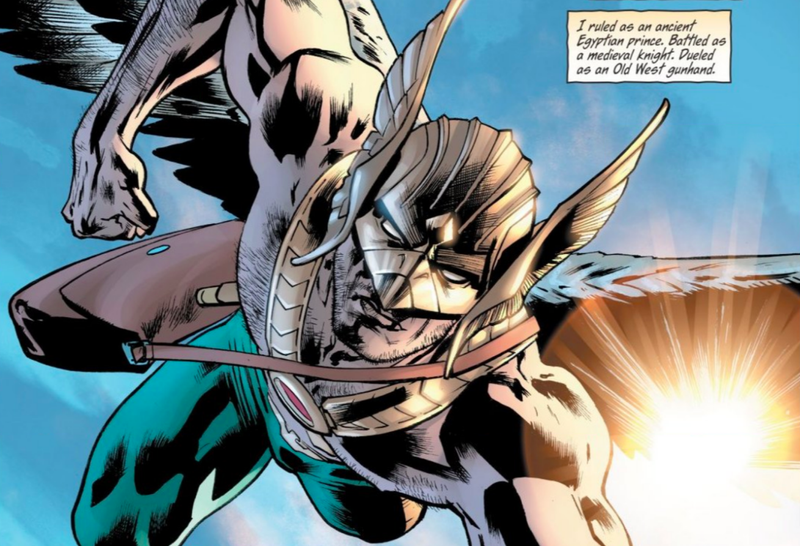 Carter Hall experiences a vision of his past lives as different variations of Hawkman. Overall, this is a welcome return for Hawkman, who’s not been seen much since DC’s 2011 New 52 reboot. A possible explanation was given during DC’s recent Dark Nights: Metal crossover, which revealed that Hawkman was one of the first victims to be swallowed up by malevolent god Barbatos. He wound up being trapped in the World Forge, a construct that helped birth the entire multiverse. Hawkman #1 ends with a sign of possible corollary effects from that experience, as Carter undergoes a series of gorgeously drawn visions that hint at a cosmically expanded status quo for the main character. In this exclusive preview of The Savage Hawkman, it&apos;s weird bad guys and weirder metals! Wait. Is DC really trying to make a Hawkman movie?